Remote Sensing Cable, 3ft for the CBA HR. 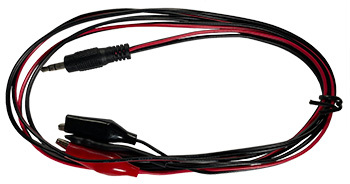 This cable connects the CBA HR to a temperature probe and to mini alligator clips (#22 wire). This 4-wire test harness improves voltage measurement accuracy by minimizing the voltage sensing lead wire resistance effect. It also includes an external magnetic probe, which when used with Extended Software allows logging of battery / ambient temperature and automatic over-temperature test cutoff. Note: To plot temperatures on the graphs, you need the Extended Software. This probe can be used with the standard software to stop a test when the battery gets too hot.